Blend the tofu, vanilla and soymilk in a blender. Melt the chocolate chips in a sauce pan over very low heat, in a double boiler or add 1-2 inches of boiling water to a sauce pan and put a heat-proof bowl on top. Stir occasionally, until the chips are melted. Add the melted chocolate chips to the tofu mixture and process until smooth. You may need to scrape down the sides of the blender a couple of times. Pour into the crust, if using, or small individual serving dishes and chill for 2 hours in the refrigerator or 30 minutes in the freezer. Top with the strawberries just before serving and garnish with the optional mint. 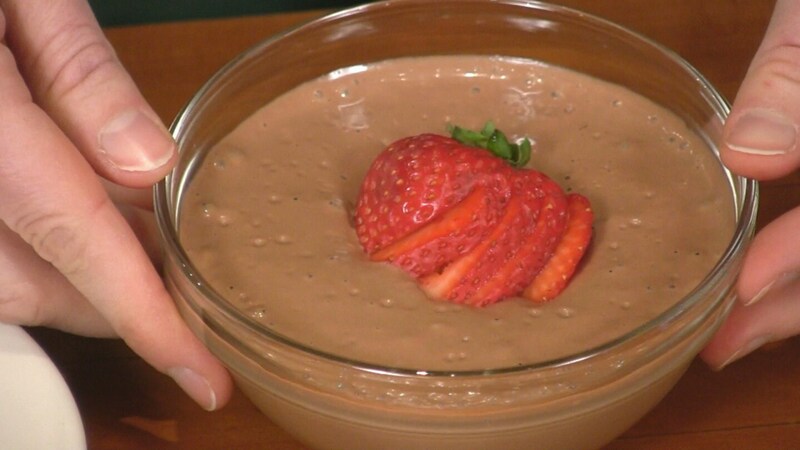 Stored in a covered container in the refrigerator, leftover Chocolate Mousse or Chocolate Mousse Pie will keep for up to 3 days. You can make this recipe with half of the tofu. Sweeten it up a bit by adding up to 1/2 cup of agave nectar, brown rice syrup or barley malt.